Sleep All Day. Party All Night. It's Fun To Be A Vampire. Sam and his older brother Michael are all-American teens with all-American interests. But after they move with their mother to peaceful Santa Carla, California, things mysteriously begin to change. Michael's not himself lately. And Mom's not going to like what he's turning into. The Lost Boys reshapes vampire tradition, deftly mixing heart-pounding terror, rib-tickling laughs and a body-gyrating rock soundtrack. $5.200 million on 1027 screens. For an unusual take on the vampire myth, we head to 1987’s The Lost Boys. As we quickly learn in the flick’s opening scene, its twist comes from the age of its bloodsuckers, as they look more like California club kids than anything else. Despite their youth, these dudes - led by David (Kiefer Sutherland) - possess as nasty a bite as more mature baddies, though the flick doesn’t immediately tell us that the undead stalk the town. Into this setting comes the Emerson family. That clan moves to Santa Carla from Phoenix and includes recently divorced single mother Lucy (Dianne Wiest), late teen Mike (Jason Patric) and younger teen Sam (Corey Haim); they go to live with her quirky father (Barnard Hughes). Despite the seemingly idyllic setting, a bit of a pall hangs over the town due to the many mysterious missing person cases. As Mike and Sam try to integrate into their new location, they go to a beach party where the older boy sees Star (Jami Gertz) and goes after her, but she eventually rides off with David. Sam ducks into a video store and encounters some antagonistic brothers named Edgar (Corey Feldman) and Alan Frog (Jamison Newlander). When Sam impresses the Frogs with his knowledge of superheroes, they slip him a vampire-related title in a subtle attempt to educate him to the local reality. They let him know how to contact them if the need arises, but he just thinks they’re kooks. Lucy also develops a potential love connection with local shopkeeper Max (Edward Herrmann) and she lands a job at his video store. During a return visit to the boardwalk, Mike re-encounters Star and they flirt. This doesn’t sit well with David, who reclaims the girl and challenges Mike to a bike race. This almost ends in disaster, so Mike tries to fight his foe. This amuses David, who invites Mike back to their lair, a former resort gone to seed after an earthquake. As they chat, David messes with Mike’s mind and eventually recruits him as part of the gang. Of course, he doesn’t know what he’s getting into, even when Star warns him he’s drinking blood. The ante raises with risky stunts like dropping through a gap in a train bridge and hanging from the beams. They dare him to let go and do so themselves. When he finally allows himself to drop, he falls but eventually finds himself mysteriously home in bed. He also has a greater sensitivity to light and sleeps all day along with a surly attitude and an aversion to milk. After Mike tries to attack Sam, the teens discover the truth: the older boy’s a vampire. Panicked, Sam calls the comic shop kids for assistance. They tell him to kill Mike, but Sam can’t bring himself to do so. When he reads the comics, Sam realizes that if they slay the head vampire, that’ll free all the others, so he and the Frog brothers set out to find the chief. The rest of the movie follows that quest as well as the development of Mike into the undead and various attempts to deal with that. I remember when Boys came out, and the premise seemed really cool. As I alluded in my opening statement, this flick presents a vampire tale from an unusual point of view, one that seems clever and provocative. Does the film fully exploit that perspective? Not really, and that is why I greeted it as a disappointment when I first saw it in the Eighties. However, that doesn’t mean the flick fails to develop some interesting elements of its own, and the final product becomes reasonably entertaining. One problem stems from the flick’s dual nature. When we see the scenes with Mike and the gang, the movie often enters high drama mode. Patric is a naturally intense actor who seems to lack the lighter qualities that would better fit with this sort of movie. On their own, those elements would be fine, but the contrast with the scenes that depict Sam and the Frogs seems extreme. When we visit with the younger kids, the movie goes for much more of a light, comedic tone. Sam provides all of the trailer lines, like when he says warns Mike he’ll be in trouble when their mom learns the truth. To a degree, the contrast in styles is interesting, but in general, it makes the movie more difficult to watch. The two formats don’t mesh well, and often Boys feels like two different movies artificially joined together. It’s kind of like Romeo and Juliet meets an Abbott and Costello horror flick. While I think Patric was inappropriately cast, the two Coreys offer surprisingly good work here. Neither of those boys ever reached master thespian level, and they eventually turned into little more than a punchline. However, they both seem well-cast here, and they help make Sam’s scenes the best of the movie. Sutherland also does nicely as the head teen vampire. As he also demonstrated in Stand By Me, Sutherland was good at the teen sociopath, though I thought his turn as David was a little too similar to his work in the Rob Reiner flick. As I watched the movie, I kept referring to David as “Ace”. Nonetheless, he brings verve to the role and makes an underwritten part more memorable. Usually more concerned with style than substance, director Joel Schumacher does make Boys look good. In some ways, it comes across like a long music video, though I don’t mean that as an insult. Well, it’s sort of an insult, as the film’s look seems a bit too stylized and artificial, and I wish Schumacher spent more time worrying about the story instead of the lighting and camera angles. Boys doesn’t feature the rapid editing we associate with music videos, though, and it generally seems satisfyingly portrayed. Of course, we find lots of Eighties elements to date Boys. That’s inevitable with most movies, but Schumacher’s emphasis on style makes the film even more heavily rooted in its era. The flick’s synthesizer score hasn’t aged well, and the other choices for music also fail to sound good. One particularly laughable example of the period’s excesses comes from a boardwalk concert performance from Timmy Cappello. Best known as the muscular sax player who worked with Tina Turner in her heyday, he looks silly all shirtless and greased up, and his music really bites. Probably the biggest problem with Boys is that it feels like less than the sum of its parts. It includes a mix of entertaining elements, and it does conclude on a solid note; the climax is fun and exciting. That helps balance out the more turgid moments in the opening act. Boys takes its own sweet time to develop the vampire threat, and those parts feel too slow-paced; they don’t do much more than frustrate the viewer. Ultimately, I do regard The Lost Boys as a moderately frustrating flick. It certainly has its moments, and overall I think it remains fairly entertaining. However, it never quite lives up to its potential, so I can’t think of it as anything more than good but not great. 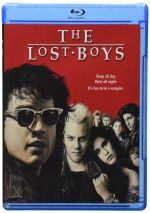 The Lost Boys appears in an aspect ratio of approximately 2.35:1 on this Blu-Ray Disc. I don’t expect much from Eighties movies, but Boys looked quite good. Sharpness seemed strong. A handful of slightly soft elements appeared in some wider shots, but those remained in the minority, as the majority of the film looked tight and well-defined. Jagged edges and shimmering created no concerns, and the image also appeared to lack noticeable edge enhancement. Print flaws never became a factor in this clean presentation. < Colors usually suffer in Eighties flicks, but not Boys. While most vampire movies go for a subdued palette, Boys went with more vibrant tones. It focused mainly on reds, as one might expect, but it showed a mix of other tones, all of which came across as lively and full. Blacks were deep and firm, while shadows appeared smooth and appropriately dense. Overall, I found very little about which I could complain in this solid transfer. While the Dolby TrueHD 5.1 soundtrack of The Lost Boys didn’t fare as well, it worked fine for a movie of this era. Compared to other films of its period, the soundfield came across as reasonably expansive and involving. The synth-based score demonstrated nice stereo imaging, and effects were appropriately placed. Blending and panning seemed a bit awkward at times, but the audio usually meshed together well. The surrounds added a good layer of reinforcement and kicked into higher gear during the various vampire scenes. They also contributed a good sense of ambience, and even a little split-surround information popped up at times. Audio quality held up acceptably well but didn’t seem great. Speech remained concise and intelligible, with only occasional examples of edginess. The score and rock songs were clear but failed to demonstrate much range. Low-end tended to be light, so although the music was tight, the dynamics seemed average at best. Effects demonstrated somewhat better bass response, though that information could be a bit boomy during louder sequences. Otherwise those elements came across as slightly thin but generally accurate. Despite some minor deficits with the audio quality, the involving soundscape helped boost this track to a “B”. How does the Blu-ray compare with the Special Edition DVD from 2004? Audio came across as fuller and smoother, while visuals appeared better defined and livelier. The DVD worked well but the Blu-ray improved on it. The Blu-ray copies the DVD’s extras, and we get an audio commentary with director Joel Schumacher. He offers a generally decent running, screen-specific chat. Schumacher goes over how he got onto the project and changes made along the way, casting and working with the actors, effects, stunts, and the budget, the music, sets, locations, and the integration of various vampire legends. Schumacher even gets into fun topics like the use of worm and fly wranglers on the set. Much of this seems quite good, but Schumacher goes silent more often than I’d like. The gaps aren’t extreme, but they’re enough to harm the track somewhat. Still, it’s mostly informative and entertaining. The Lost Boys: A Retrospective fills 24 minutes seconds as it presents the usual array of movie clips and interviews. We hear from Schumacher, executive producer Richard Donner, director of photography Michael Chapman, and actors Kiefer Sutherland, Corey Haim, Corey Feldman, Jamison Newlander, and Edward Herrmann. We learn about how Schumacher came onto the flick, casting and approaches to the parts, the film’s visual style, production design and costumes, and some general memories and reactions. A smattering of useful new information appears here, mostly from the actors. However, more than a little of the material seems redundant after Schumacher’s commentary, as he covers much of what we get here. It’s a decent but unexceptional recap. After this comes Inside the Vampire’s Cave, a series of four shorter pieces that run a total of 18 minutes and 31 seconds. We find more from Schumacher, Donner, Chapman, Haim, Feldman, Herrmann, Sutherland, and Newlander. We learn more about the re-imaging of the original screenplay and his take on the subject, the director’s style, balancing laughs and terror, the appeal of the vampire genre and the prospect of a sequel. All the interviews come from the same sessions as those in the prior program, and “Cave” feels like an extension of it. The piece continues to suffer from some repetition with the commentary, and it doesn’t add a lot. Even the sequel discussion doesn’t tell us much, so don’t expect a lot of strong material here. Vamping Out: The Undead Creations of Greg Cannom takes 14 minutes and two seconds to look at the movie’s makeup effects. We hear from creature creator Cannom plus Schumacher, Herrmann, Chapman and Sutherland. We get notes about Cannom’s origins in the field plus the specifics of the work he did for the movie. One of the best supplements in this set, we learn tons about the material in this tight and informative program. The Vampire’s Photo Gallery also presents 77 shots of the various makeups and animatronics. Next we go to a section called “The Return of Sam and the Frog Brothers”, which starts with Haimster and Feldog: The Story of the Two Coreys. It runs four minutes and 30 seconds as Feldman and Haim talk about their joint careers. We hear about how they first met and how they became a team. It sounds superficial but it proves surprisingly compelling. More Corey goodness shows up in the Multi-Angle Commentary. It includes three separate looks at scenes from both Coreys plus Newlander. Unfortunately, it presents all three on their own and doesn’t reunite them. Each segment lasts 18 minutes, 23 seconds. Haim gives us a few bland notes but mostly just narrates the shots; skip it. Matters get worse with Feldman’s discussion, as he prefers to play stand-up comic. He tosses out wisecracks and very little actual information. While not excellent, Newlander’s track proves vastly more interesting than the other two. He offers lots of fun trivia bits and displays little ego as he discusses his goofs and other silly moments. Newlander offers the only useful commentary of the three. For unused footage, we head to The Lost Scenes. The disc presents these as one long piece without chapters to mark them; we get 16 segments for a total of 15 minutes and 16 seconds of material. Nothing scintillating appears here. We see more of Mike and Star, plus additional bits related to the family as well as Max’s wooing of Lucy. These expand existing threads but fail to provide much in the way of new information other than Mike’s thoughts about quitting school. An interactive feature called A World of Vampires lets us learn a little about different areas’ vampire legends and facts behind them. This consists of short snippets that run a total of about 13 and a half minutes. Surprisingly informative and detailed, these pieces are short but useful, as they give us a tight little look at the history. The set finishes with the flick’s trailer plus a music video for Lou Gramm’s “Lost In the Shadows”. It mostly consists of the usual movie clips and lip-synch singing, and it comes across as silly. Although The Lost Boys never quite lives up to its potential, it still offers a fair amount of fun. At times it can’t match its comedic and dramatic sides well, but it occasionally soars as it provides a reasonably entertaining piece. 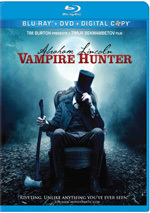 The Blu-ray brings us strong picture and audio as well as a good complement of bonus materials. This becomes a nice release for a fairly entertaining film.